Get a great price on the Vapefly Pixie RDA from Vapor DNA. 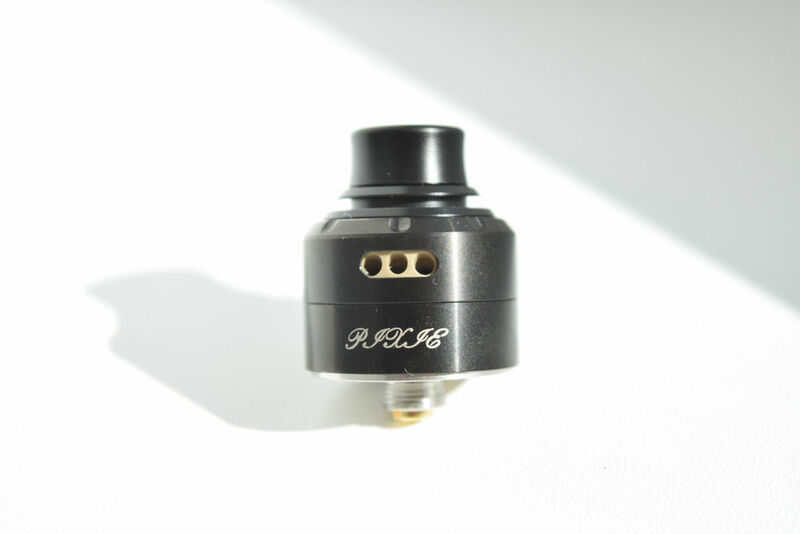 Following the success of the innovative Galaxies MTL RDA, the guys at Vapefly are back with something new and exciting – a mini RDA produced in collaboration with Ferdinand Factor, an experienced designer from the Philippines. 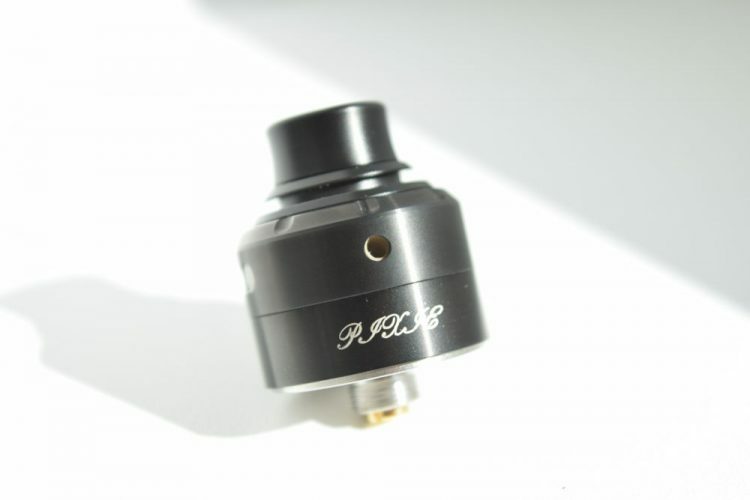 Called the Pixie RDA, this 22mm atomizer has interchangeable airflow adapters, an anti-heating top cap, as well as several other cool features I’ll try to go over in this review. I can’t comment too much on the packaging as the sample I received came in a special reviewers’ kit that clearly said that the commercial version would be different. However, what I can talk about are the contents, which I can confirm are the same as the final version of the product. Inside the small cardboard box we have the Vapefly Pixie RDA sitting in a Styrofoam holder and underneath that we have two small accessory bags. 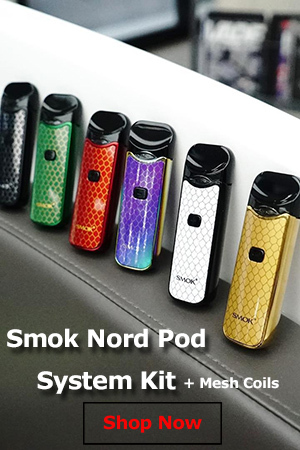 One contains a three-head screwdriver, a bunch of spare o-rings, a couple of grub screws for the deck posts, a plastic adapter for the airflow slot, as well as a hollow 510 pin for squonking. The other bag contains two pre-made Ni80 tiger coils, as well two strands of Vapefly’s proprietary Firebolt cotton. These are basically pre-loaded cotton leads that easier and quicker to insert through your coils. I’m not a big fan of tiger coils or Ni80 for that matter, but I’m not going to complain about something that’s offered for free. 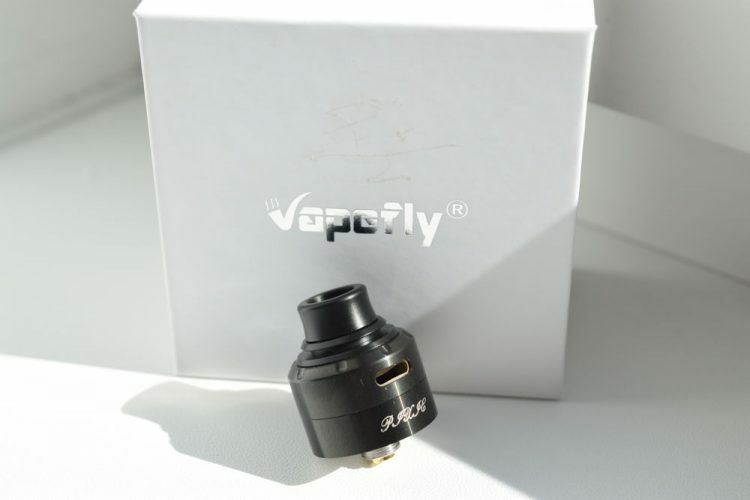 Some companies don’t even include coils, let alone two of them for a single-coil RDA, so props to Vapefly for throwing them in. As its name suggests, the Vapefly Pixie is a small single-coil RDA, measuring just 22mm in diameter and 24mm from the drip tip to the base, not including the pin. 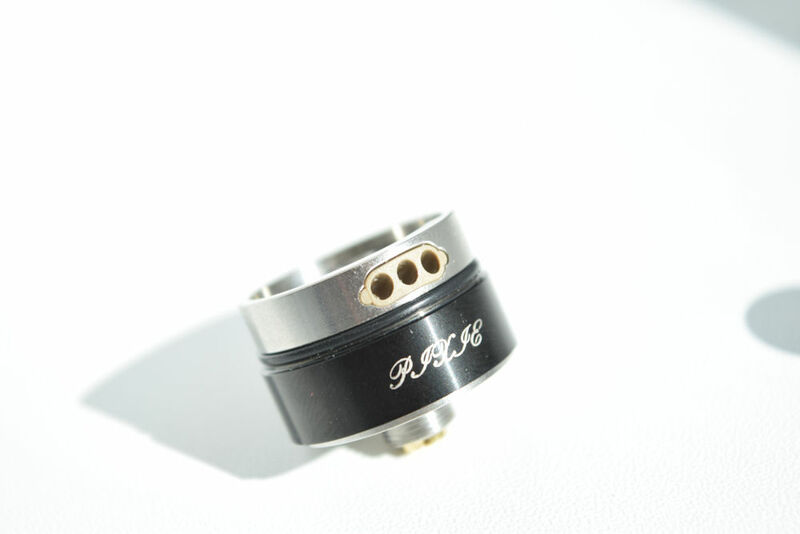 It’s made primarily of stainless steel and Delrin, and comes in black, stainless steel, gold, gunmetal and rainbow. 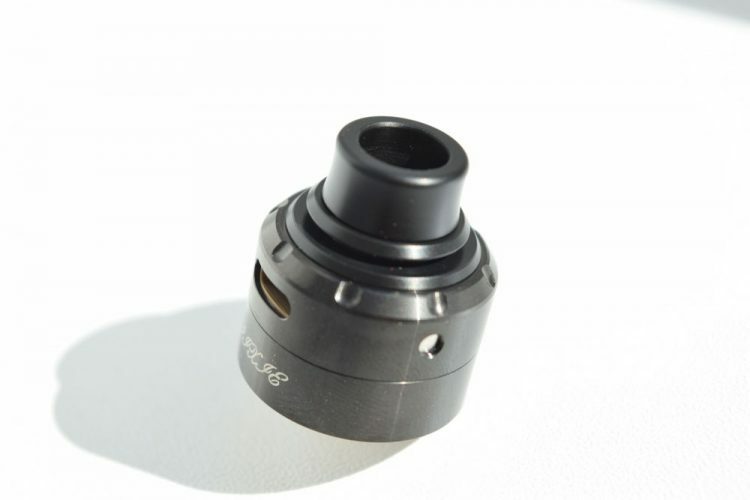 The Pixie comes with a 510 Delrin drip tip that looks larger than it actually is. The bottom section is actually part of the top cap even though it’s also made of Delrin. 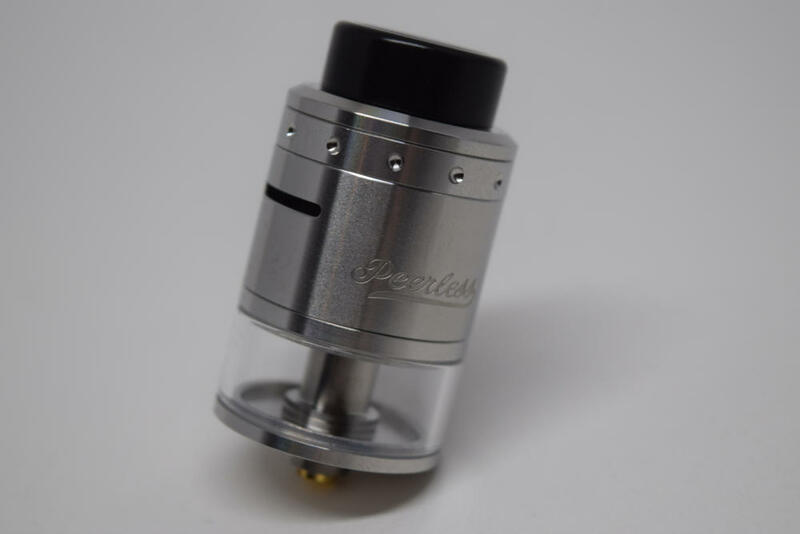 This is what the anti-heating solution that Vapefly and Ferdinand Factor came up with – adding a layer of Delrin on top of the stainless steel top cap to minimize the burning sensation you would otherwise feel when vaping at high wattage on such a short RDA. It’s actually pretty cool and the Delrin blends pretty well with the stainless steel, at least on the black Pixie I received for this review. 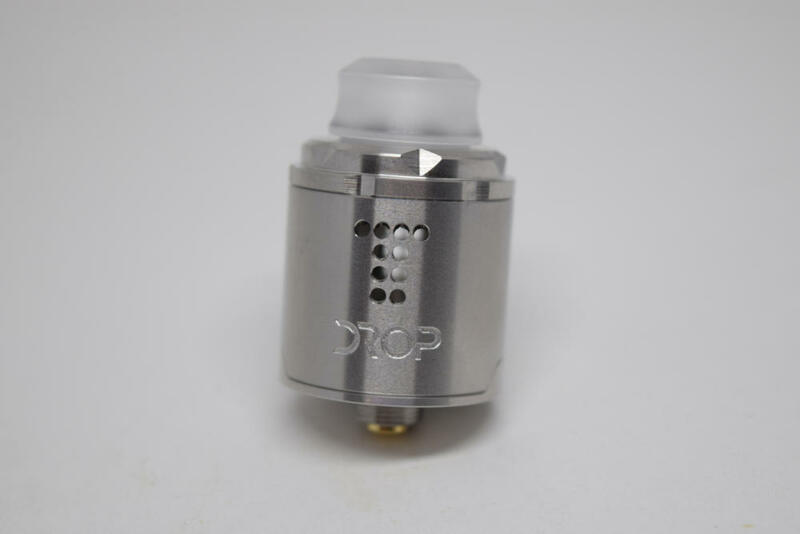 On the sides, the top cap features two airflow slots, a larger one for direct lung vaping, and a small, round one for mouth-to-lung. That’s right, the Vapefly Pixie can be used in both direct lung and MTL mode, but don’t expect a super-tight, cigarette like draw in MTL mode. Yes, it’s very restrictive, but it doesn’t come close to the draw on an analog. To use the Pixie in MTL mode, just rotate the top cap until the small airflow hole is aligned with one of the three round slots on the barrel of the RDA. 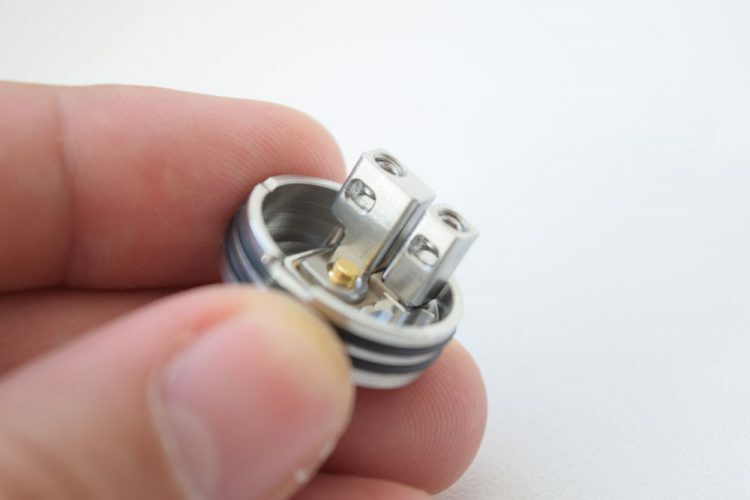 To use the Vapefly Pixie in direct lung mode, you can either align the large airflow hole on the top cap with all three round slots on the barrel, but for the best vaping experience, you can replace those three slots with one very large one, by switching airflow adapters. Those three holes are actually a plastic adapter which you can push out from the inside of the barrel and simply replace with the single hole one included in the kit. This is the interchangeable airflow adapter design I mentioned in the beginning of the review, and it’s actually pretty interesting. Both adapters are slanted downwards so you need to keep that in mind when installing your coil, to make sure that the airflow is directed straight at it. The barrel also has “Pixie” written on it, but the font was kind of a poor choice, in my opinion. It’s a fancy handwritten font the kind people use for engravings, but it just doesn’t work here. It actually makes the word almost unreadable, unless you know beforehand what it is supposed to say. I for one wish they had went for the simpler font used to emboss the name on the base. The base of the Vapefly Pixie features a gold-plated, adjustable 510 pin which actually protrudes quite a bit by default. On the inside we have a pretty simple build deck, with the posts offset to the side, to free up the center for the coil, and a fairly spacious, albeit not very deep juice well. On each side of the deck posts you’ll notice small notches cut into the edges of the juice well, which are supposed to act as guides when you are installing the coil. Basically your coil jig should slide into those notches and the coils should be parallel with the posts. 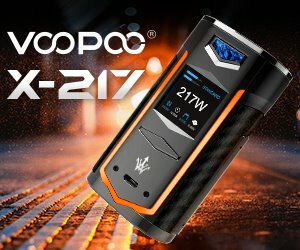 Vapefly are definitely not the first to use this system, but I think it’s a good idea at least for beginner builders. The deck posts are very simple to build on. One is a bit thicker than the other, but that’s purely for aesthetic purposes. 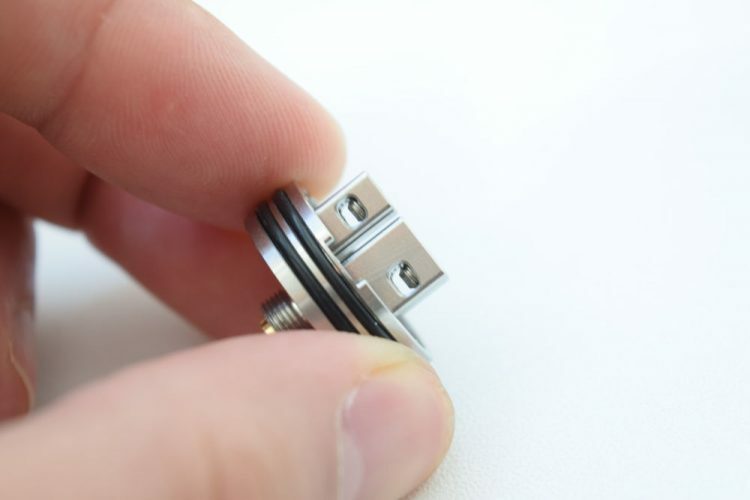 They both have the exact same size coil slots – huge ones – and all you have to do is insert the leads, makes sure the coil is centered, tighten the hex screws at the top of the posts, clip the leads and you’re good to go. 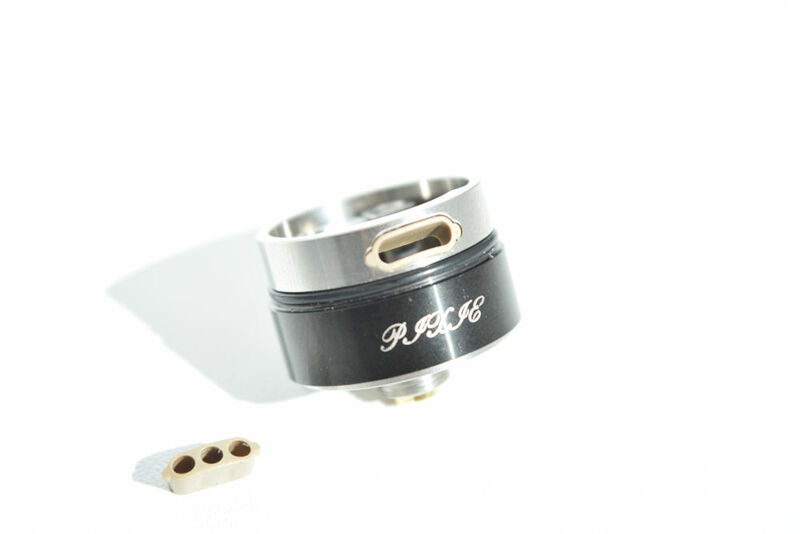 All in all, a really cool mini RDA that introduces some cool ideas, like the interchangeable airflow adapters. The build quality is decent, although they could have done a slightly better job with the machining, at least on the juice well, which could definitely look smoother. But, overall, it’s not bad. As I mentioned in the beginning of this review, I didn’t really like the included Ni80 tiger coils (0.35Ω), so I used one of my favorite stapled Clapton coils (0.25Ω) instead. 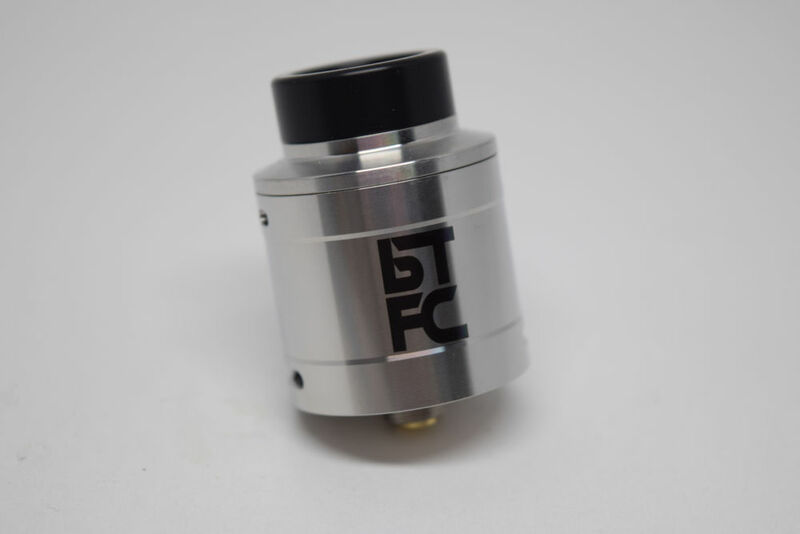 Installing it was a breeze, and this is definitely one of the main qualities of this RDA, it’s really easy to build on. In terms of performance, the anti-heating system definitely works, as despite the low profile of this atomizer, my lips never got hot. However, you do want to make sure hot juice droplets don’t fly into your mouth either. Vapefly claims that the offset posts ensure that juice doesn’t fly straight up from the coil into your mouth, but I don’t really see how that works. I think the best way to prevent spitback is to make sure the coil doesn’t have any hot spots, so either stroke it really well to get those hot spots out, or space out the coil. Also, make sure you don’t over drip, as that could send some hot droplets flying into your mouth too. As far as performance goes, it depends a lot on what coils you’re using too, but you can expect this little guy to put out great flavor and decent clouds as well. These low profile mini RDAs are usually designed primarily for flavor. With the distance from the coil to your mouth being so short, you can expect some great flavor from the Pixie, but vapor is not bad either. One thing I like about the Vapefly Pixie is that despite its reduced height, the airflow holes are quite high-up and slanted down, so unless you really overdo it with the dripping, you don’t have to worry about e-liquid leaking. I can’t comment on the RDA’s MTL mode simply because I haven’t tested it. I don’t do mouth-to-lung usually, and I certainly don’t intend to do it on an RDA, so I’ll let you figure out how it performs in that mode. 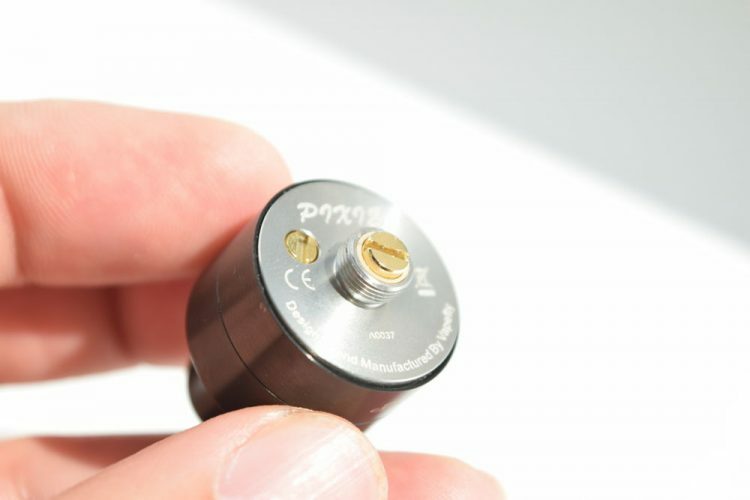 If you’re looking for a new 22mm low-profile RDA, the new Vapefly Pixie is actually a really solid option. It’s simple to use and build on, introduces some cool new ideas, like the interchangeable airflow adapters, and actually puts out great flavor. Vapor production is not bad either, but this is a single coil RDA so it’s not going to be something crazy. For just $23, I think the Pixie should definitely be on your radar, especially if you’ve been looking for an RDA that works for both lung inhale and mouth to lung vaping.